I have never made pastry before in my life. I have used premade stuff frequently (and frequently had disasters with it) so I’m not a complete stranger to it but I do rather have the fear about it. 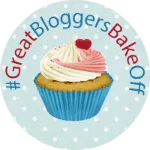 Watching Great British Bake Off did not settle my fears – the custard tart fiasco was terrifying! 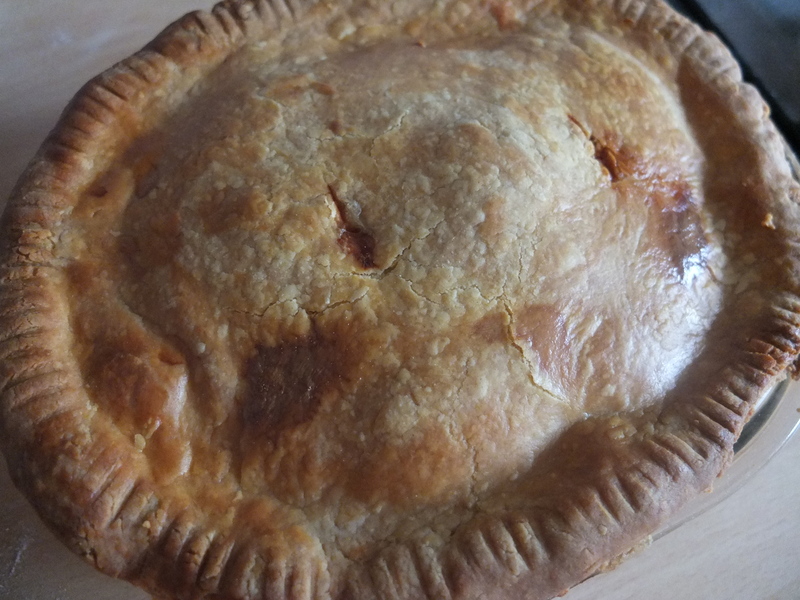 With the collapsed tarts clearly in my mind, a personal dislike for fruit pies (right there with you, Ali) and filo pastry looking like the most difficult thing ever, I decided a savoury ‘double crusted’ pie was the way to go. I also had the added problem of wanting to be able to feed it to my fussy kids. It was this that led me to the original idea of a sausage pie. My kids never refuse sausages so making that the main flavour could be a winner – now all I had to do was work out how to make pastry! After a lot of internet surfing I realised that basic savoury pastry didn’t actually sound as scary as I thought it was. I can make flour and butter into a breadcumb-like mixture and it surely can’t be that hard to add a bit of liquid to it and make it a dough. Right? Almost every recipe I saw involved adding a fair bit of salt and black pepper to the pastry mix and I didn’t want to be too heavy on the salt for the kids and I can’t stand pepper so I improvised a little. I added the tiniest pinch of salt, substituted one spoonful of water with ketchup, threw in a teaspoon of paprika and hoped. It made a dough, I thought it might be a little dry but being utterly clueless I just went with it, wrapped it up and lobbed it in the fridge to chill. Then I mixed chopped onion with some sausage meat to make the main filling for the pie. I considered adding more herbs or spices to it but decided against it, not wanting to add to my battle with the kids come tea-time. Pastry chilled, I set about rolling just over half of it to make the base of the pie. It was a bit swirly with pink from the paprika and ketchup and I had images of ending up with a marble effect pie at the end. 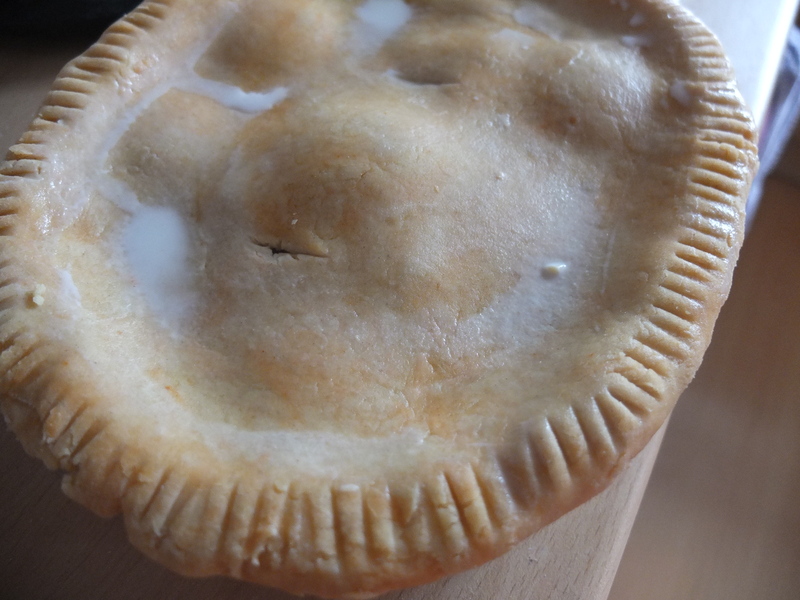 It was horrible – took about ten attempts to get it into the pie dish and there were several patch jobs using the spare bits that I cut off to neaten it up. Pie dish lined, I spread the sausagemeat and onion mix over the bottom, then covered this with a layer of bacon and then broke five eggs onto the top of that. I did my best to spread the eggs out evenly but two of them stubbornly refused to be separated. 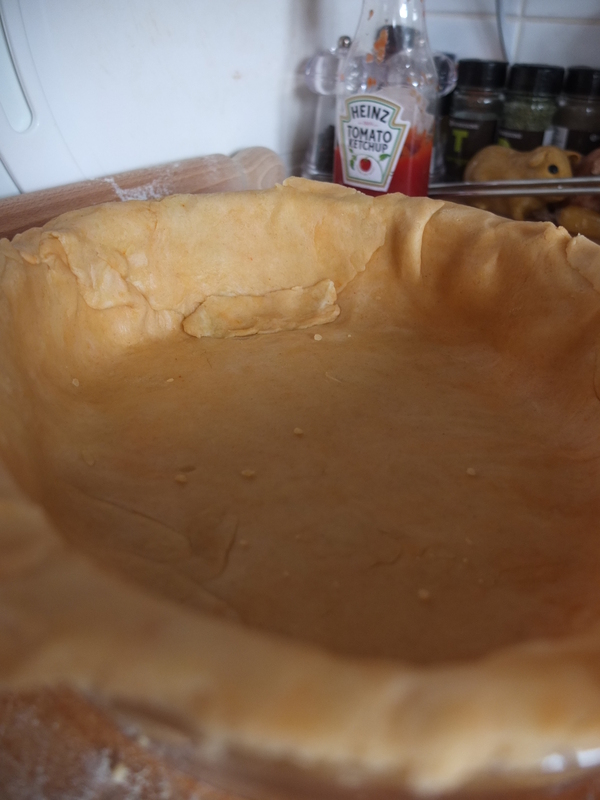 I then rolled out the rest of the pastry to make a lid, struggled to lay it over the top and then realised I had forgotten to wet the edge of the bottom layer the stick it down so then had to cackhandedly brush milk under the lid. In an attempt to make it pretty, I used a fork to crimp the edges, made two steam holes in the top (carefully trying to avoid the eggs) and brushed it gently all over the top with milk. It was a bit lumpy looking but not too bad, so into the oven it went. I may have done some GBBO-style oven crouching whilst it was cooking too. Mostly because I was utterly clueless and making it all up and didn’t want to poison everyone with undercooked pork. The final pie smelled amazing and, despite the lumps, looked pretty good too! It was a monster to slice – the first piece came out in bits. However, it was hearty, meaty and the pastry was crisp so I was happy. I was also thrilled with the fact that my layering looked pretty good when it was sliced . 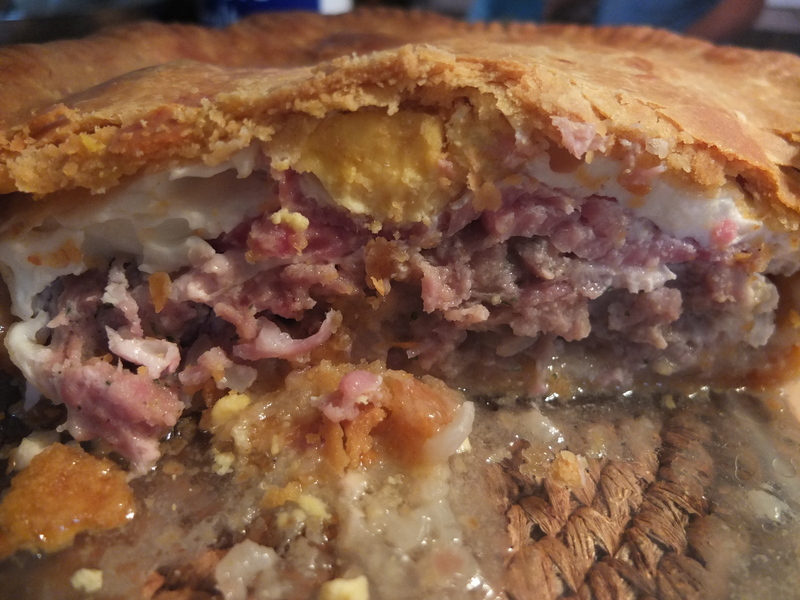 The pastry at the bottom was crisp and crumbly (even in the middle) but it was sort of soggy because of the fatty meat juices – once the pie had cooled completely it wasn’t soggy at all. YAY! The pie was very tasty warm (and yes, the kids ate it!) but is possibly even better cold. 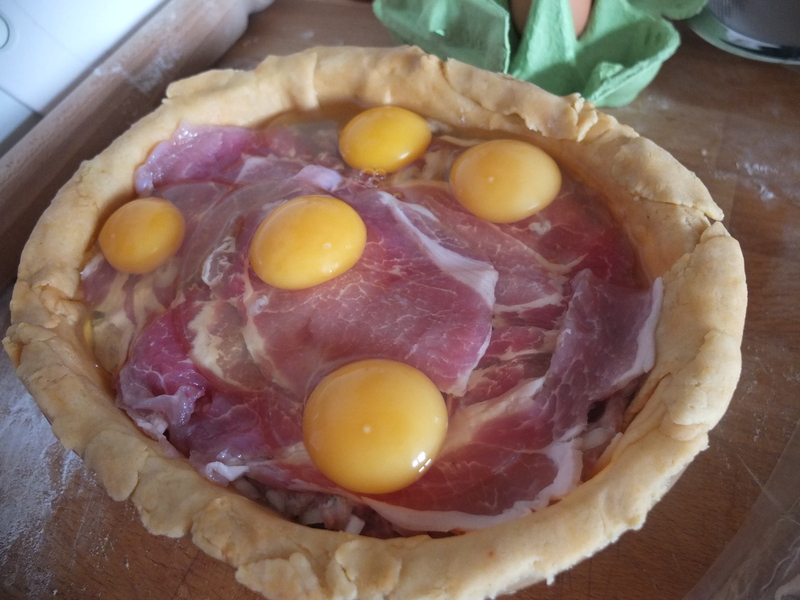 It’s more pork pie-like than anything and I will definitely be making it again, especially if we are heading out on a picnic! Oooh, wow. My husband would go absolutely crazy for this. What a great combination to put in a pie 🙂 And no soggy bottom? Yay! i think this is such a great pie filling concept – i think a lot of men across the country wouild love to dig in and eat some probably served along side some chips and beans! Funny – I had the last of it with chips and beans tonight!! wow Carole, that is brilliant! I love that you improvised with your pastry & came up with the filling to suit your family & even better that the kids ate it too!